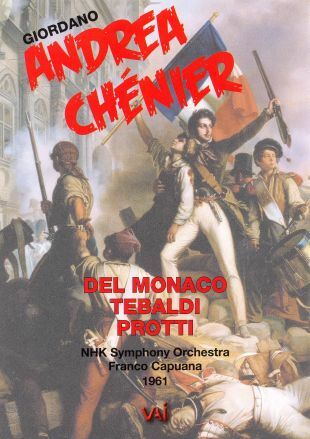 Set just before and during the French Revolution, Umberto Giordano's Andrea Chenier focuses on the love triangle formed by the title character, an up-and-coming poet; Maddalena, the daughter of an important Countess; and Gerard, a poor servant to the Countess who bitterly resents the manner in which the rich treat the poor. Gerard's feelings for Maddalena are initially unexpressed and unnoticed, who becomes infatuated with Chenier soon after they meet. She begins writing anonymous love letters to the poet; he becomes obsessed with finding out who wrote them, causing him to stay in France rather than flee after the Reign of Terror begins. In the chaos, Gerard has lost track of Maddalena, of whose feelings for Chenier he is unaware. Now a top figure in the Revolution, he wishes to save and marry her. Meanwhile, Chenier has discovered Maddalena is the one who has been writing the letters. A spy, Incredibile, convinces Gerard that he must make a false accusation against Chenier to obtain Maddalena, and he does so. Maddalena offers to give herself to Gerard if he will save her beloved, and though he tries to do so, he is unsuccessful. Chenier is sentenced to death and Maddalena bribes a guard to let her take the place of another who is sentenced to die, so that she and her love may be together forever in death.